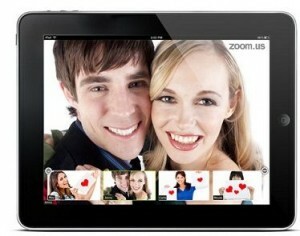 Skype video chats just got some competition from Zoom.us, a free service that lets up to 15 people chat at once, on phones, tablets and computers, or a mix of all three. When one person is talking, their face dominates the screen and the rest are seen in thumbnail images. To add someone to a chat, just send them a link. Skype charges $10 a month for group chats, but has nearly 700 million users for individual calls. If you use the text messaging feature on an iPad 2, the new iPad, or an iPhone, the new version lets you include photos in the body of the message. There’s no limit on the size of the photos. There are no text messaging charges.